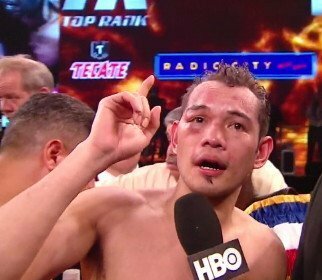 Nonito Donaire (31-2, 20 KO’s) plans on leaving no doubts about who the better fighter is this Saturday night in his HBO televised fight against 37-year-old Vic Darchinyan (39-5-1, 28 KO’s) at the American Bank Center, in Corpus Christi, Texas, USA. Donaire, 30, wants to go out quickly and score a knockout over Darchinyan to make sure that he doesn’t get his own offense in gear. The last time they fought in 2007, Donaire had to take some hard shots from Darchinyan for four rounds before getting him out of there in the 5th round with a big left hook that Darchinyan ran into. This time Donaire wants to finish off Darchinyan will before the 5th by nailing him with something big in the first couple of rounds before he’s had a chance to get warmed up. When isn’t Donaire looking for a knockout? He seems like he’s always looking for a KO, and up until he faced a much superior Guillermo Rigondeaux recently, Donaire had done a pretty good job of doing that, or at least dominating his opponents. He couldn’t do either of those things against Rigondeaux, and he ended up getting badly schooled for 12 rounds. The judges gave the victory to Rigondeaux by the scores 116-111, 115-112 and 114-113. Those scores were very generous to Donaire because he looked like he won 2 rounds at best. At worst, just one round and that was the round where Donaire got a flash knockdown of Rigondeaux by hitting him when they were in a clinch. Darchinyan will be looking to get a knockout because it’s really the only chance he has to win this fight. He’s slower and older than Donaire, and he doesn’t have the skills to win a decision unless he’s able to put him on the canvas a number of times. The southpaw Darchinyan will need to keep his right hand held high at all times if he wants to keep from getting knocked out because if he lowers his like he did last time they fought then Donaire will knock him out again with a big left hook.